The main purpose for the Title I Affiliate is to create a network to share resources around State and Federal Programming, especially the requirements for the On Site Review (OSR). Files in Dropbox are now accessible from this website page. English Learner population growing in our area ... see the EL data report. If you plan to use the Our School Data to help with identifying students "eligible" for Section 31a, please see the instructions to download a file in the Feb 16 minutes. Please complete the MSDS form and you may find the Comprehensive View Report helpful (old instructions). Still not working Table of Contents and a Calendar for Compliance please edit. Access to our previous work can be found here, this provides for the REQUIRED written processes for the OSR versus the above work that is above and beyond the requirements. There are templates that were created and a future project may be to link the MAISD written processes with the twelve required processes for the OSR. Rumor has it that the "official" Program Evaluation Tool is NOT getting any smaller. MDE/AdvancED officially released in August, 2015 that the ASSIST platform is going away, to be replaced by eProve. The plan is "to release components of the platform beginning in 2015-16" but "MDE is not planning a statewide transition to eProve before the start of 2017-18." We will continue to advocate for the power of dialogue while evaluating programs and the reduction of questions in the P.E.T. 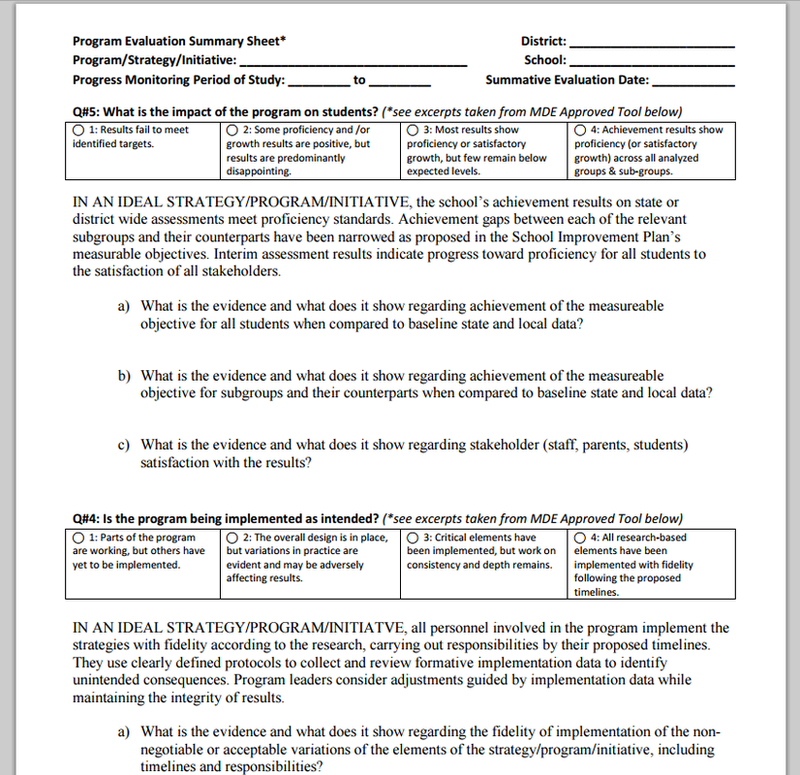 (Program Evaluation Tool). Maybe this year we simply focus on dialogue around the Compact Prog Eval (or Word Doc)seen below and simply comply to laborious form in ASSIST that is fading away.